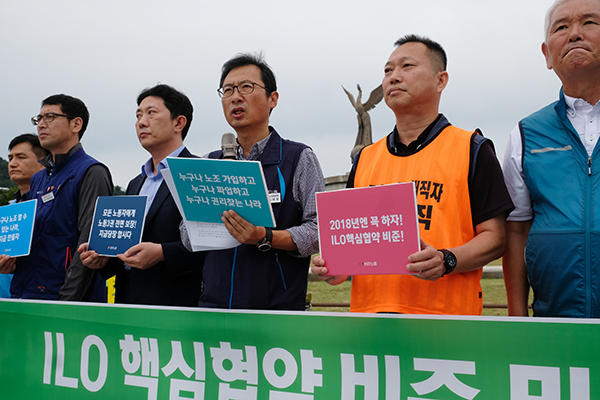 The Korean Confederation of Trade Unions(KCTU) reignited the move for the ratification of core ILO conventions ahead of the ILO's 100th anniversary next year. KCTU called on the government and the ruling Democratic Party to carry out the institutional improvement through removing stumbling blocks foreseen in the process of the ratification of relevant conventions and to show their commitment to the revision of the related laws. KCTU held a press briefing in front of Fountain Square of the Presidential Office on September 13 and call on the government to "ratify core ILO conventions and guarantee the trade union rights for all workers through the revision of the labor laws." South Korea has ratified only 29 ILO conventions among 189 conventions and has yet to ratify the core conventions of No. 29, No. 87, No. 98 and No.105 which guarantee the right to organize and prohibit the forced labor. KCTU called for the revision of the Trade Union and Labor Relations Adjustment Act and the Criminal Code to deal with 7 pending legislation tasks in relation to the guarantee of trade union rights: trade union rights for non-regular workers including special types of employment, report system for union registration, voluntary negotiations for multiple unions, basic labor rights in public sector, ban on the application of the obstruction of business in relation to industrial action. KCTU also urged the government to take administrative measures to the issues which can be resolved without the revision of the laws, suggesting that the government withdraw its notice of the illegal status of the Korean Teachers and Educational Workers' Union, reinstate dismissed government employees and teachers, and reduce the scope of essential businesses in public sector. KCTU reportedly plans to submit its demand proposal for the revision of the labor-related laws in relation to the ratification of core ILO conventions to a body called 'the labor relations institution and practice improvement committee' on September 14, which was set up to work for the top leaders' meeting among labor, business and the government with the aim of reshaping the social dialogue in Korea.